Chaparral football coach William Froman knew it would take a few games for his young team to get into a rhythm, especially on offense. But Froman also knew he had senior running back Antonio Thomas as the Cowboys’ workhorse. Thomas didn’t disappoint in the season opener Friday night, scoring three touchdowns, including the 15-yard winner with just over two minutes remaining, as Chaparral defeated Sierra Vista, 28-25. Thomas carried the Cowboys with 135 yards on 15 carries, 81 in the first half, and Chaparral equaled its 2011 win total. 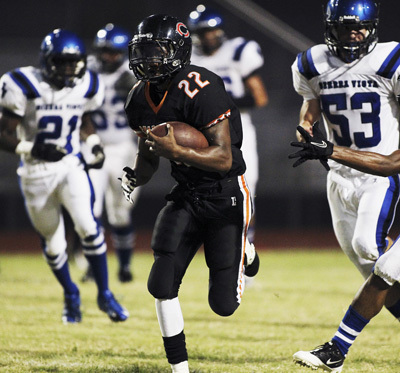 Sierra Vista, which led three times, had one final chance after Thomas’ final score. The Mountain Lions drove from their 20-yard line to the Chaparral 40, but quarterback Deyon McKinney was sacked at midfield on the final play. Sierra Vista opened the scoring on the second possession, going 43 yards in five plays. Quarterback Octavius Payne scored on a 24-yard run, but was ejected following the run because of two personal fouls. Chaparral immediately answered as Thomas took the ensuing kickoff 90 yards to tie the game at 6-all. The teams again traded touchdowns, as McKinney scored on a 47-yard run and Thomas answered with a 56-yard run, with Armando Zarate’s conversion kick putting Chaparral ahead 13-12. McKinney’s 1-yard run just before halftime sent Sierra Vista into the locker room with an 18-13 lead, and they quickly padded the lead in the third quarter. Thomas fumbled the second-half kickoff and the ball landed in the arms of Mike Dominique, who raced 24 yards for a touchdown and a 25-13 lead. Chaparral dominated the final 13 minutes, however, with Tyquan Anderson’s 56-yard touchdown run setting the stage for Thomas’ decisive score. Anderson added 75 yards on nine carried for Chaparral. McKinney led the Mountain Lions with 97 yards on 12 carries, while Maliek Broady added 72 yards on 14 carries. Sunrise Mountain 48, Western 0 — At Sunrise Mountain, senior quarterback Chris Moore scored on two 3-yard runs and passed for touchdowns of 13 and 28 yards to propel the Miners to the program’s first victory over a varsity opponent. Sunrise Mountain opened in 2009 and was 0-26 against varsity competition, having beaten two junior varsity teams. The Miners dominated on the ground in the first half, rolling up a 31-0 lead. Junior Romello Tatum scored on an 82-yard run on a direct snap in the first quarter and finished with 139 yards on seven carries. Junior Sherman Nash rushed for 90 yards, including touchdowns of 15 and 21 yards, and also made an interception. Western quarterback Larry Jennings passed for 113 yards and was picked off twice, with both interceptions resulting in touchdowns that were negated by penalties. The Warriors are coming off an 0-9 season marred by a hazing incident on campus that resulted in the forfeit of their final three games. 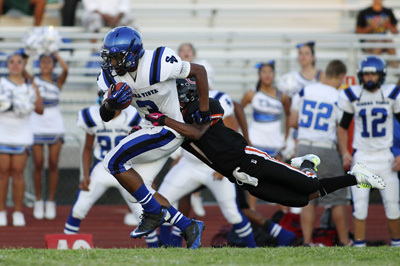 Boulder City 16, Mojave 13 — At Boulder City, J.D. Owens and D.J. Koopman ran for touchdowns and Billy Viera threw a pair of 2-point conversion passes to lift the Eagles the win over the Rattlers in the opener for both teams. Owens rushed for 86 yards on 21 carries and Koopman supplied 80 yards on 14 carries. The Rattlers cut the deficit to three on a late touchdown catch, but Boulder City was able to run out the clock. Ty Flanagan rushed for 225 yards for Mojave. Tyreek Carter had a 30-yard interception return for a score for the Rattlers. Zack Arave added 43 rushing yards, including a 12-yard TD run. Moapa Valley 45, Pahrump Valley 7 — At Pahrump, Conner Mortensen rushed for 229 yards and four touchdowns on 15 carries as the Pirates (1-1) blasted the Trojans (0-1). Mortensen scored on runs of 9, 29, 31 and 34 yards. Jared Repp rushed for 109 yards and a touchdown on 13 attempts and scored on a 30-yard interception return for the Pirates, who led 26-0 after the first quarter. Sean McConnell scored on a 24-yard run and caught two passes for 54 yards for Moapa Valley. Pahrump Valley’s A.J. Segura completed 7 of 8 passes for 85 yards and one TD with one interception. Virgin Valley 53, Clark 13 — At Mesquite, the Bulldogs scored all 53 points in the first half and cruised past the Chargers. Alex Yoder and Andrew Arjana scored rushing touchdowns for Clark. Chadwick School (Calif.) 49, The Meadows 14 — At Los Angeles, the Dolphins led 49-7 at halftime to defeat the Mustangs in their season opener. Meadows quarterback Jacob Gleason threw for two touchdowns and Bryson Brickart gained 80 yards on 13 carries. For Chadwick, Cameron Bartlett scores on runs of 11 and 29 yards and added an 80 yard kickoff return, Peter Mavredakis supplied two touchdown runs and Cole Freeman threw for two scores. Layton Christian (Utah) 41, Mountain View 0 — At Layton, Utah, the Saints committed seven turnovers during a season-opening loss to the Eagles. Nick Edwards rushed for 74 yards and two touchdowns for Layton Christian. Enterprise (Utah) 17, Lincoln County 12 — At Panaca, the Wolves used a third-quarter touchdown and two-point conversion to secure the final margin of victory in both teams’ opener. Lincoln County’s touchdowns came on Preston Avery’s 2-yard run and Ryan Rippetoe’s 40-yard pass to Derek Cheeney. Spring Mountain 84, Beaver Dam (Ariz.) 0 — At Spring Mountain, the Golden Eagles raced to a 40-0 first-quarter lead and never looked back. The game was played under running time for the final three quarters. Tonopah 48, Whittell 20 — At Zephyr Cove, Seth Littlefield and Spencer Littlefield each scored three touchdowns to carry the Muckers to the season-opening victory. Tonopah finished with 612 yards of offense.